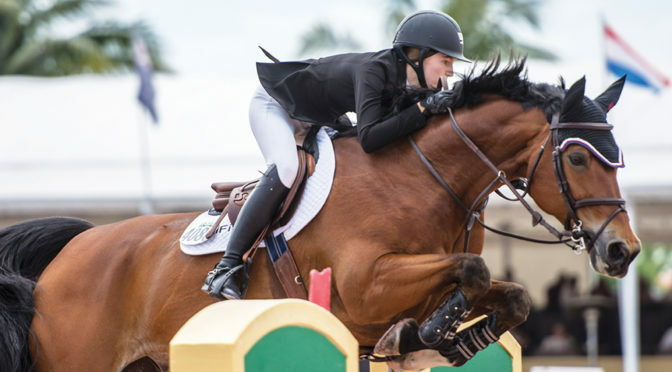 Show jumping runs in the family for Lucy Deslauriers, daughter of Canadian Olympian Mario Deslauriers and Grand Prix rider Lisa Tarnopol Deslauriers. A rising show jumping star, she won the 2015 George Morris Excellence in Equitation Award at the Palm Beach International Equestrian Center. In 2016, Deslauriers was awarded the Lionel Guerrand-Hermès Trophy by the United States Equestrian Team. The award is for young riders who exemplify both sportsmanship and horsemanship. She notched a huge win in 2017 during Week 8 of WEF in the 1.50-meter $100,000 Suncoast Jumper Classic CSIO4*. Of the field of 49, she had a fault-free finish to the top of the leaderboard. That year, she had victories riding her prized mount Hester in Wellington, Spruce Meadows, North Salem and more. In 2018, Deslauriers and Hester topped a 23-horse jump-off to win the $132,000 Equinimity WEF Challenge Cup CSI5* during Week 12 at WEF. She made her Nations Cup debut at the Thunderbird Show Park in Langley, British Columbia, helping the U.S. to a fourth-place finish, which secured the team a spot in the 2018 Longines FEI Jumping Nations Cup Final in Barcelona, Spain.